Bananas: a big-hearted ancient fruit. I’ve been looking forward to writing this post about bananas since I started blogging, but stalled and delayed because I was unsure where to start. The Latin word for banana is Mūsa. Translated into English it means Muse: a source of inspiration, a guiding spirit. The banana, it seems, dates back to the beginning of time. It’s a fruit of the ancients, a plant whose history goes back so far no one is sure where it began. 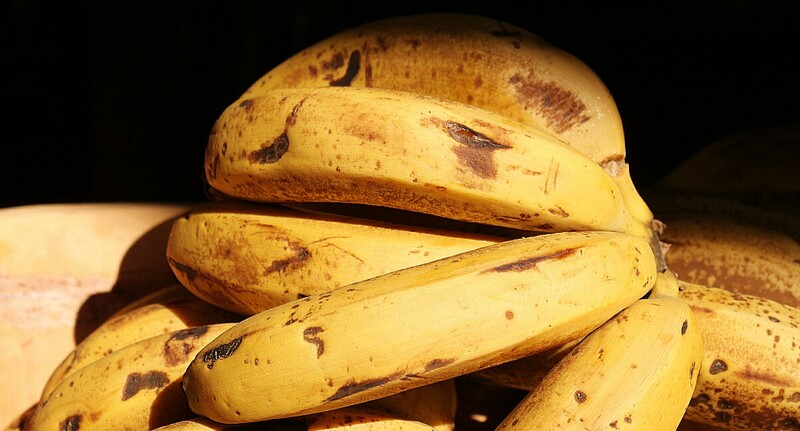 I read that the word banana may be of West African origin, derived from the Wolof word banaana and then adopted by Spanish and Portuguese traders. Plátano in Spanish; mai’a in Hawaiian; and ntochi in the Zambian dialect, Chinyanja, the banana is a universally-appreciated tropical plant that provides nourishment for our bodies, fiber for clothes, paper on which to write, biodegradable plates and containers, food steamers, adhesives, purifiers, and even umbrellas. The banana plant has been given sacred deity status in countless traditional cultures, and has been immortalized in popular culture through music as diverse as the 1923 novelty song, Yes! We Have No Bananas, to the art-rock band Velvet Underground’s debut album cover, painted by Andy Warhol. The farm’s most recent banana plantation. 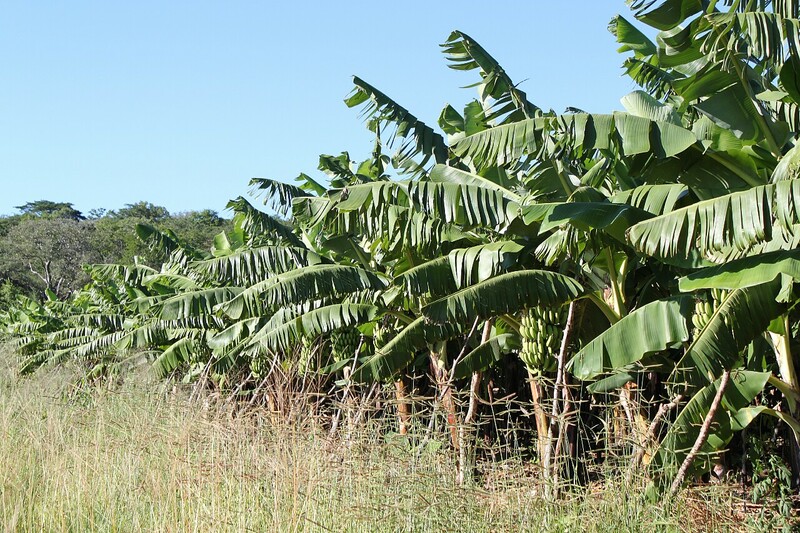 Bananas are intrinsic to our farm and our community. Chris grows 20 hectares, nearly all of which are sold to local vendors in the town of Livingstone, 20 kilometers away. His bananas are a crop that have continued to give year after year–that have helped support the farm and its workers through many challenging times, and which continue to do so today. Our table is seldom without a bowl of bananas. The sweet flesh of a just-ripened banana is matched only by its nutritional benefits, which includes Vitamins B6, A and C, potassium, magnesium, folate, lots of fiber and much more. Over-ripe bananas can be prepared in many tasty ways. Bananas are my go-to fruit when I am asked to entertain at short notice because of the myriad ways in which one can prepare them. I take special pleasure in using up our over-ripe bananas and have different recipes to share with you in time. Just the other day we had nine German visitors for whom I prepared a dessert in which I used over-ripe bananas combined with pineapple. 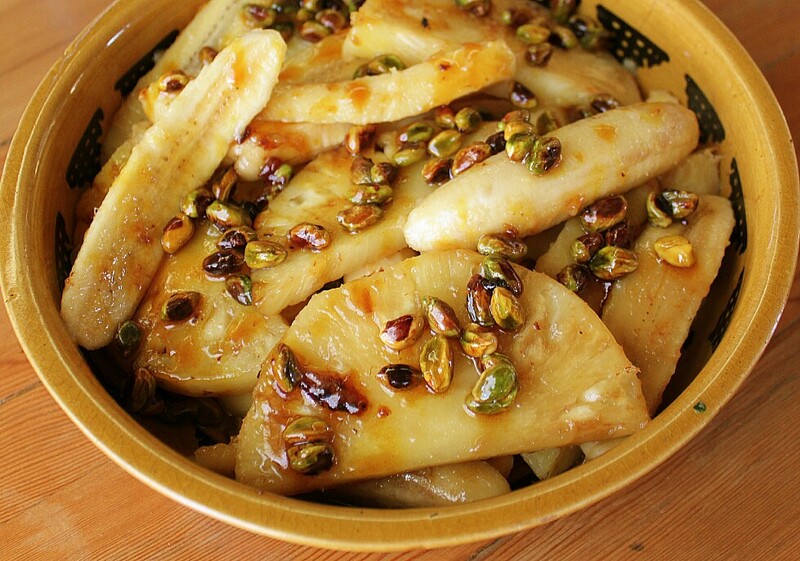 I sauteed the bananas, pineapple and a cup of pistachio nuts in a couple of tablespoons of coconut oil. Just before removing them from the heat I poured in two tablespoons of rum and added a tablespoon of butter. This on its own was delicious, but I jazzed it up with a cup of my Ginger & Turmeric Syrup. I carefully transferred the softened fruit from the frying pan into a serving dish, and put them in a warm oven. I brought the syrup up to the boil in the frying pan, reduced it until slightly caramelized, and then drizzled it over the warm fruit. I served the dessert with whipped cream, but vanilla ice cream would be just as delicious. Coconut & Rum-infused Tropical Fruit with Ginger & Turmeric Syrup. Wow. Bananas are more interesting than i thought . We eat a lot of them in our house. From Queensland mostly. Wow..you are amazing the way you take something like an ordinary banana and create a dish like this one !